here tonight it is cast in the form of a rosary. The women of the parish keen the newly dead. in a gold jig of candle-flame, on moaning tongues. they are making rhythm, a cradling-frame. They are humming her life, saying her. *Keening: a chant for the dead, denounced by the Roman Catholic Church. 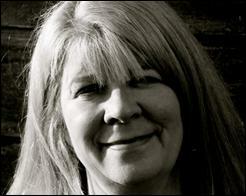 Kathleen Kenny is a writer of Irish parentage who lives and works in Newcastle upon Tyne, England. She earns her living as a part-time creative writing tutor at the Centre for Lifelong Learning. Her latest collection of poems, Firesprung, was recently published by Red Squirrel Press.